More than 20 years ago I ran a mobile dj service, one of my first employees was Doug. Over the years Doug and I worked together in radio. Doug has been telling me about the building he lives in along with his room mate Alex. Doug isn't necessarily convinced that the building is haunted, however Alex seems to have a different opinion. 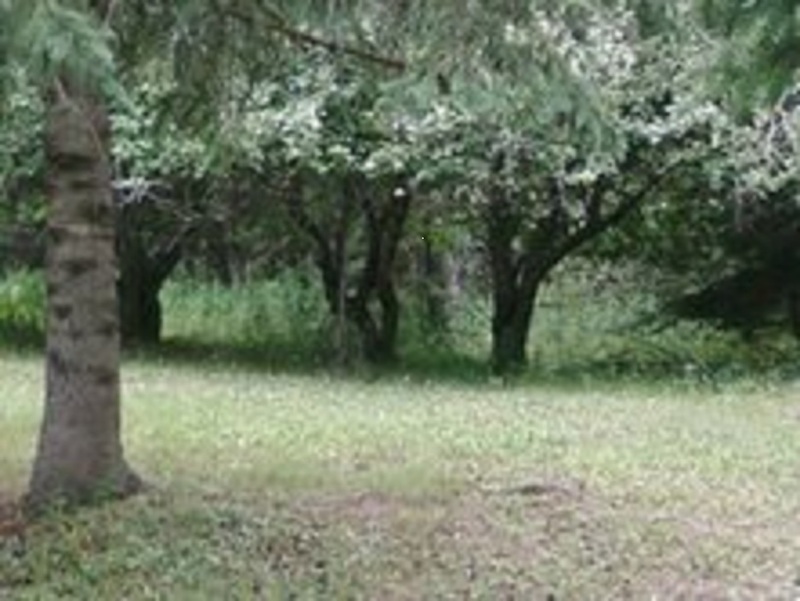 To the left is a picture of a pretty good sized orb that Alex's girlfriend shot. Alex showed me many pictures of orbs, some would argue it's dust. Well, in two of the shots, the orb moved from one rafter to another. It almost looks like there are a couple of orbs in this picture, I know that doesn't prove anything. Do you believe in ghosts? Have you ever had a strange experience? Have you ever had an object dissappear only to have it reappear? Have you ever seen an apparition? Have you ever heard loud pounding noises or heard a rap at the door and no one was there? Most of us want to see an apparition, most will probably not see that. However, most of us will miss some of the signs: Light bulbs blowing, electronic devices failing, cold spots, pounding, dream visitations, your kids talking about invisible friends, animals acting strange. From what Doug told me I was under the impression that Alex may have a negative spirit harassing him. My main objective was to make sure that wasn't the case and then it would be up to Alex to decide what to do with his visitors. First, I contacted Dan Dunlop who has had a fair amount of experience in dealing with what some term negative energies. Then we set up a time to meet with Alex and do a walk through. The building we went to has 3 floors and a basement. Doug and Alex live on the main floor, the top 2 floors need renovation. When we arrived at the residence Doug was out of town but Alex was kind enough to let us in and show us around. Alex showed us the many pictures of the orbs. Some didn't come out as clean when I transferred them from his Facebook site. I did a brief interview with Alex and Dan using my handy dandy "cheap" cassette (hi-tech?) recorder. Actually the sound is pretty good on that archaic piece of recording equipment. Then off we went to the basement. Dan is pretty good at sensing spirits, so he would walk a bit and try to feel if there were any spirits present. Initially Dan has said he felt at least 3 sprits before we even walked into the building. When we made our way toward the front of the building we started asking questions. Perhaps I could pick up an e.v.p. on my cheap cassette recorder, would that blow away all of those high tech ghost hunting shows? I can't say that I watch those shows too much, they just don't appear to be real, how can they have spirit activity everywhere they go? It usually doesn't work that way. However, when we were in the basement all 3 of us heard someone walking above our heads. There was no one else in the building. I think it picked up a little bit on my recorder, you can listen to that part in the show. Eventually we made our way to the third floor and then back to Alex's living room. Dan felt there were no dark energies in the building, however he sensed 2 of the spirits were ready to cross over. After a short meditation he helped them cross, Alex said he felt their energy leave. In a way he was sad because he had connected with them, and yet he was happy for them to find their way. Dan said he felt there were 3 more energies in the building and asked Alex if he wanted them out. These beings would not cross over, they would just be sent packing to some other location. Alex didn't want them to go, I can only guess that he has a connection with them. Alex has been alone in this building for quite a while recovering from an ongoing illness, so I can see why he might want to have some company. Furthermore, the way I look at it, all beings have a right to be and if they're not bothering me I'd probably let them be as well. Next week I talk to a local farmer who had 2 crop circles in his corn last October. The weird part, he lives less than a mile from my house! Ah, home sweet home. 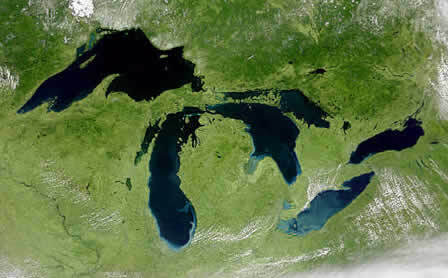 If you look at the picture most of you will recognize the Great Lakes. Some of you will see Lower and Upper Michigan on the map unless you were napping in geography. Obviously the lower looks like a mitten and anyone from there will usually point to their hand to tell you where they are from. Those of us from the U.P. will turn our left hand sideways (at least I do) to show our location. As you look at the map, almost in the center you will see part of Wisconsin that creates a bay, that is called the Bay of Green Bay. If you look at the very tip of that peninsula (the Door County Peninsula in Wisconsin) you will see a little island. (Washington Island) Almost due west of there across the bay is where I broadcast from, Escanaba Michigan. Population: 13,000. I am fortunate to live here, somewhat remote and surrounded by forests, rivers, inland lakes, the Great Lakes and the paranormal. When I first heard about the Great Lakes Triangle it was many years ago with Leonard Nimoy on his program In Search Of. For many years I have pesonally heard of strange tales on both land and sea. Just doing this program has made me aware of other unexplained events that would have just slipped away into history. I think there is no denying it, we see a lot of ufo's up here. We see them on land and over the lakes. We see them go in and out of the the lakes. So, as far as I'm concerned, it's nothing new. As for strange weather phenomena, I personally have not talked to anyone who has witnessed extremely strange weather on the Great Lakes. My father in law sailed the lakes, he loved it. I have friends who fish the lakes, who boat on the lakes, from time to time I go fishing and kayaking on Lake Michigan. No vortex has ever swallowed me up that I know of. As I was researching this weeks show I found it odd that a woman filed a story in 1978 dealing with a strange fog that surrounded her sailboat and two others near their vessel. Strange things happened within this fog. It reminded me of Bruce Gernon's experience with what he termed an electronic fog in one of my previous interviews. If you're not familiar Bruce is one of the few who has experienced this fog, but that was in the Bermuda Triangle. In 1978 Kathy Doore left Chicago on board a sailboat and had a unique experience that few have had. What was it? Also you will hear some audio (courtesy of you tube) of Jay Gourley who authored The Great Lakes Triangle. Gourley believed a lot of the incidents took place around the Agonic Line, or the line in which magnetic north and true north are precisely the same direction. Everything from the freakish story of Flight 389 from New York to Chicago, to the wreck of the Edmund Fitzgerald. Also I threw in some audio of an interview with an eyewitness who shot a pretty clean video of a ufo on Lake Erie. Of course the tv station out of Cleveland had to poke fun at the story, they always do. So, is there something mysterious going on in the Great Lakes? Can this be compared to the Bermuda Triangle? Isn't strange weather to be expected near large bodies of water? Did a former co-workers husband disappear under this phenomena? Many years ago I heard that the past, present, and future were happening at once. I didn't understand that statement then and I don't understand it now. How can that work? 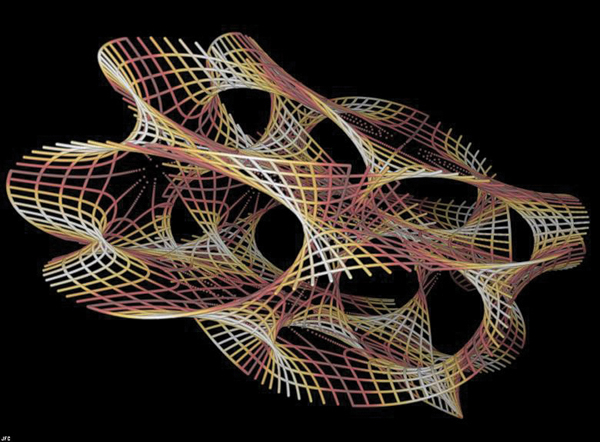 I've heard that there are multidimensions that are right next to us that are playing out all kinds of possibilities regarding our lives. I guess that makes sense. Some have claimed that they've traveled through time, I guess anything is possible. I've always thought if you could travel through time wouldn't you affect the outcome of the future? I don't have any answers to those questions, yet I believe all things are possible. A few months back I found a site that was promoting some of my shows. The author of the site is Mark Rainer, who hails from northwest England. Mark hosts a site that deals with Numerology and Astrology. That is not what this interview is about, through emails Mark told me of what he felt was a multidimensional experience he had. A couple of years ago my guest had his first ghost experience, where he was on a ghost hunt and he was the only one in the group to physically see this woman dressed in period clothes. About a year ago Mark had a really strange experience regarding time travel, or at least seeming to be connecting with other time periods. Sound strange? Were they ghosts? Mark doesn't think so. It's almost as if he was able to enter end even communicate with others in different time periods. Is it all connected? Again, it seems like as more awareness comes to the planet we are finding more people tapping into unusual experiences. Mark has only been experiencing these things for a couple of years so it's still a mystery to him. This was my first show using Skype.